Pulpit and angel with the trumpet. Pierre-Noël Levasseur. (1690-1770). Gilded and polychromed wood. 1726. 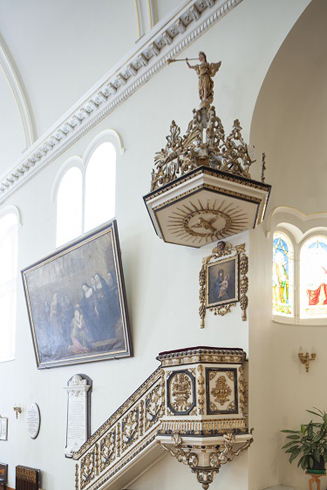 In the past, priests would climb into the pulpit, above the congregation to deliver his sermon at Mass. This magnificent sculpture was designed by Pierre-Noël Levasseur in 1726. Did you notice the angel with the trumpet enthroned just above the pulpit’s abat-voix? Balanced on the point of one foot, it’s an artistic miracle in and of itself! In some interpretations, this angel is believed to be announcing the Final judgement. Our congregation prefers to believe that he is proclaiming the Good News.